North American Ruddy Duck Pairs are shipped as young adults and flight ready (unless you choose to have them pinioned). You will receive one male and one female adult North American Ruddy duck. Ordering a quantity of "1" will add one male and one female to your order. 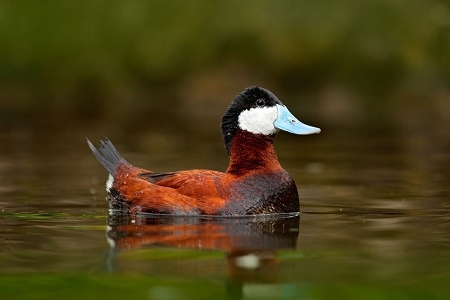 North American Ruddy ducks are well known as underwater swimmers, and require a sufficient pond area in order to keep them, as they are almost always found in the water. The North American Ruddy duck has a unique blue bill coloring that does not mature to full coloring until two years of age, while both the male and female will bloom their full plumage of feather coloring the in the wintertime.